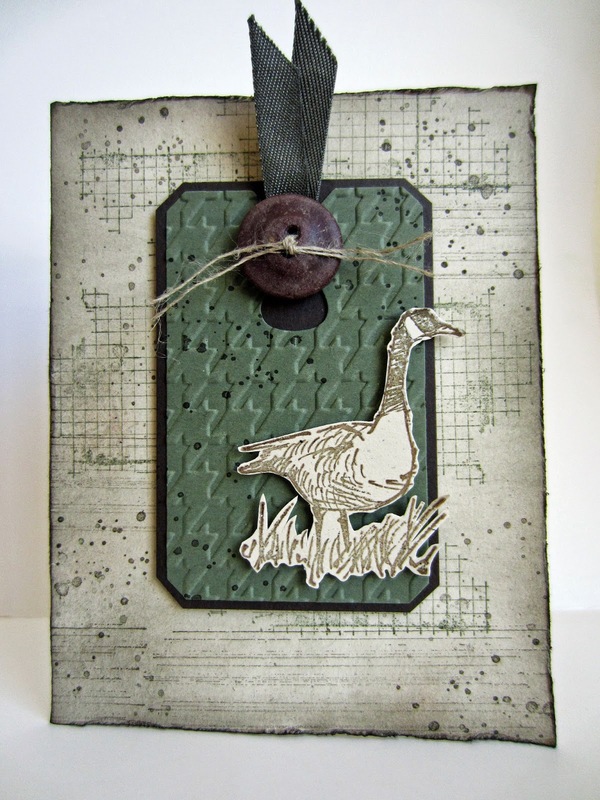 I had so much fun creating my Grungy Goose card! Pure pleasure from start to finish. As soon as I saw the sketch for the latest Freshly Made Sketches challenge, I knew EXACTLY what I was going to set out to do. And I did it. 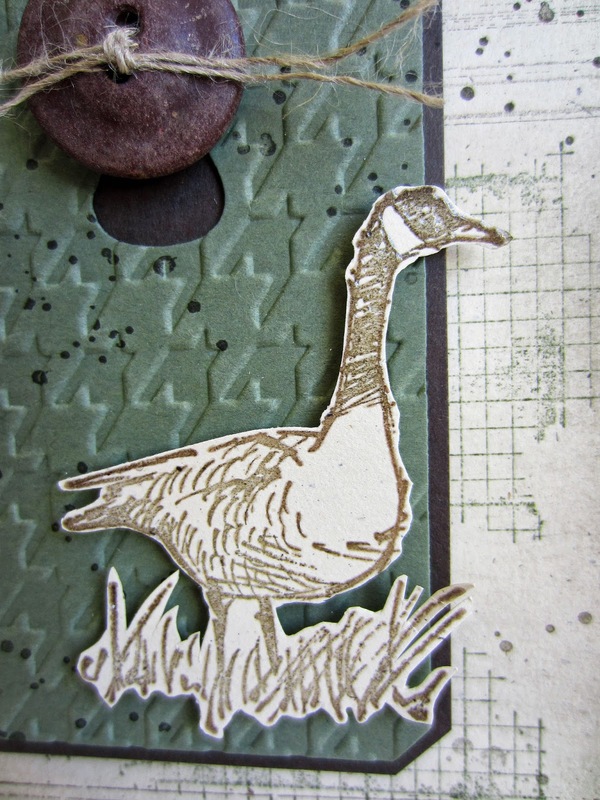 Don't you just love this majestic goose from the Wetlands stamp set? I surely do! I stamped him on Naturals Ivory in Early Espresso and VersaMark, then embossed him with clear embossing powder. I then cut him out, leaving just a whisker of white margin outside the embossed edges. His little background tag is made from Always Artichoke and my favorite from the Chalk Talk Framelits. The tag was embossed inside the Houndstooth embossing folder. Then I dragged out a couple more of my favorite stamp sets: Gorgeous Grunge and Off the Grid (so sad it's retired! ), adding some grungy effects to the tag and the Naturals Ivory card base with Always Artichoke and Early Espresso, some of it stamped off first, some of it full strength. I then utilized a very personal tool, one that I am very attached to: my fingernail. I used my fingernail to rough up the edges of the card. To add to the grunge, I sponged the edges and into the card itself with Early Espresso. I knew I wanted to use a brown button on the top of the tag. So I grabbed my jar of brown buttons. Sigh. Starting to go through the vast assortment, I tried several as possibilities. Until I got to this gorgeous grungy antique button! Perfection personified! I used a snippet of the Artichoke Denim Ribbon (retired), wound a length of Linen Thread around the base of it, then threaded it through the button holes, and tied it in a knot. 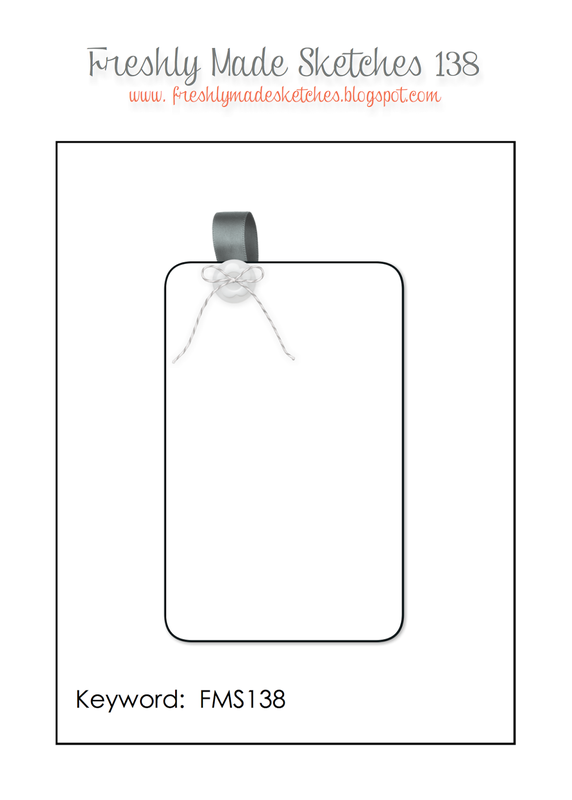 The completed embellishment was adhered to the tag with a couple of Glue Dots. I mean, REALLY, isn't that button PERFECT?!? I had purposely left the space at the bottom of the card less cluttered with the intention of adding a sentiment. "Happy Father's Day" was the natural option for this card. But, I was so pleased with the way it turned out, sort of a little piece of artwork, that I opted for no sentiment. You can always stamp something appropriate inside the card. So, share with us: Do you participate in any challenges? Once in awhile or on a regular basis? Which challenges are your favorites? Do they really help get your creative juices boiling? Love how you snipped those guy out! Looks great! Thanks for joining us at FMS! What a great card Linda! I love that button and the goose! 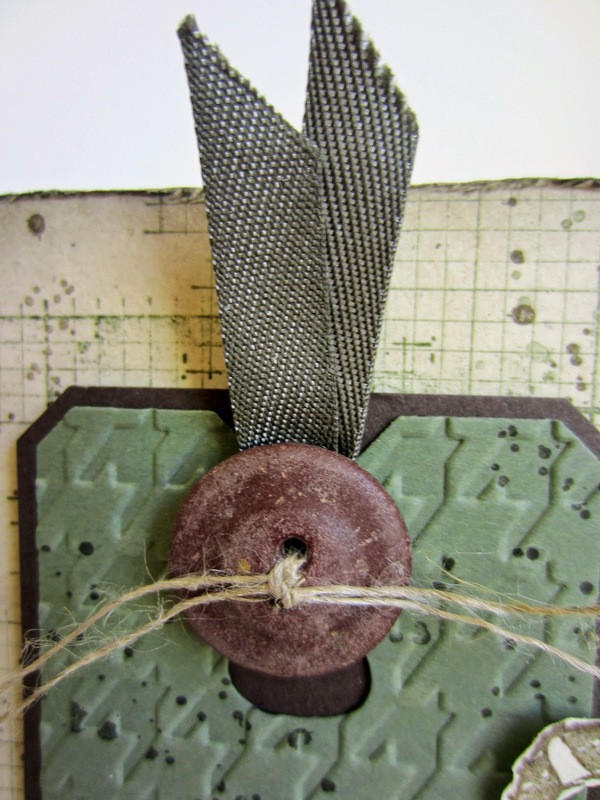 Love the Off the Grid and Gorgeous Grunge stamp sets in the background! Thanks for joining us this week at Freshly Made Sketches! Wonderful card. The grungy button with its linen thread is the perfect finishing touch. That card is great! I love how you made it. I love the gorgeous grunge! Love the little goose! so cute! Thanks for sharing with us at Your Designs This Time! Very nice tag! Thanks for stopping by Weekends Are Fun to add your link to our Party, I appreciate that and I wanted to let you know that I have Pinned Your Photo to our Weekend Party Board!! So cute! Thanks for stopping by and adding it to The Creative Exchange!